Clayton and Kaldor (1987, Table 1) present data on observed and expected cases of lip cancer in the 56 counties of Scotland between 1975 and 1980. The expected number of cases was determined by a separate multiplicative model that accounted for the age distribution in the counties. The goal of the analysis is to estimate the county-specific log-relative risks, also known as standardized mortality ratios (SMR). If is the number of incident cases in county i and is the expected number of incident cases, then the ratio of observed to expected counts, , is the standardized mortality ratio. Clayton and Kaldor (1987) assume there exists a relative risk that is specific to each county and is a random variable. Conditional on , the observed counts are independent Poisson variables with mean . where and are fixed effects, and the are county random effects. The following DATA step creates the data set lipcancer. The expected number of cases is based on the observed standardized mortality ratio for counties with lip cancer cases, and based on the expected counts reported by Clayton and Kaldor (1987, Table 1) for the counties without cases. The sum of the expected counts then equals the sum of the observed counts. The term is an offset, a regressor variable whose coefficient is known to be one. Note that it is assumed that the are known; they are not treated as random variables. transforms the covariate measuring percentage of employment in agriculture, fisheries, and forestry to agree with the analysis of Breslow and Clayton (1993). The DDFM= NONE option in the MODEL statement requests chi-square tests and z tests instead of the default F tests and t tests by setting the denominator degrees of freedom in tests of fixed effects to . calculates the fitted standardized mortality rate. Note that the offset variable does not contribute to the exponentiated term. The OUTPUT statement saves results of the calculations to the output data set glimmixout. The ID statement specifies that only the listed variables are written to the output data set. The GLIMMIX procedure displays in the "Model Information" table that the offset variable was computed with programming statements and the final assignment statement from your GLIMMIX statements (Output 45.3.1). There are two columns in the matrix, corresponding to the intercept and the regressor . There are 56 columns in the matrix, however, one for each observation in the data set (Output 45.3.1). The optimization involves only a single covariance parameter, the variance of the county effect (Output 45.3.2). Because this parameter is a variance, the GLIMMIX procedure imposes a lower boundary constraint; the solution for the variance is bounded by zero from below. Following the initial creation of pseudo-data and the fit of a linear mixed model, the procedure goes through five more updates of the pseudo-data, each associated with a separate optimization (Output 45.3.3). Although the objective function in each optimization is the negative of twice the restricted maximum likelihood for that pseudo-data, there is no guarantee that across the outer iterations the objective function decreases in subsequent optimizations. In this example, minus twice the residual maximum likelihood at convergence takes on its smallest value at the initial optimization and increases in subsequent optimizations. The "Solutions for Fixed Effects" table displays the estimates of and along with their standard errors and test statistics (Output 45.3.5). Because of the DDFM=NONE option in the MODEL statement, PROC GLIMMIX assumes that the degrees of freedom for the t tests of are infinite. The p-values correspond to probabilities under a standard normal distribution. The covariate measuring employment percentages in agriculture, fisheries, and forestry is significant. This covariate might be a surrogate for the exposure to sunlight, an important risk factor for lip cancer. 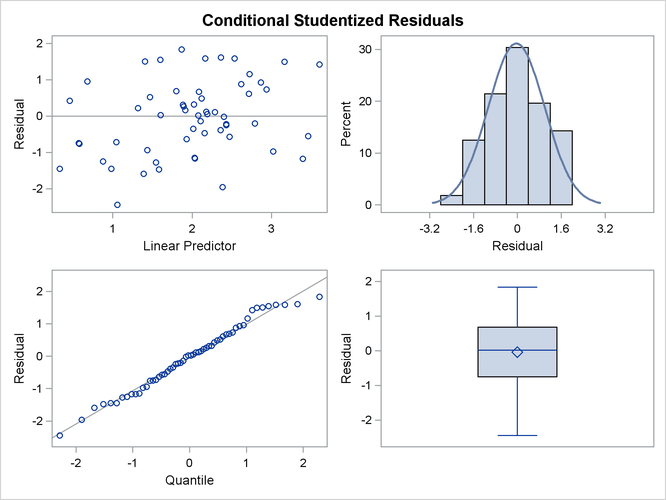 The graph in the upper-left corner of the panel displays studentized residuals plotted against the linear predictor (Output 45.3.6). The default of the GLIMMIX procedure is to use the estimated BLUPs in the construction of the residuals and to present them on the linear scale, which in this case is the logarithmic scale. You can change the type of the computed residual with the TYPE= suboptions of each paneled display. For example, the option PLOTS= STUDENTPANEL(TYPE=NOBLUP) would request a paneled display of the marginal residuals on the linear scale. The graph in the upper-right corner of the panel shows a histogram with overlaid normal density. A Q-Q plot and a box plot are shown in the lower cells of the panel. 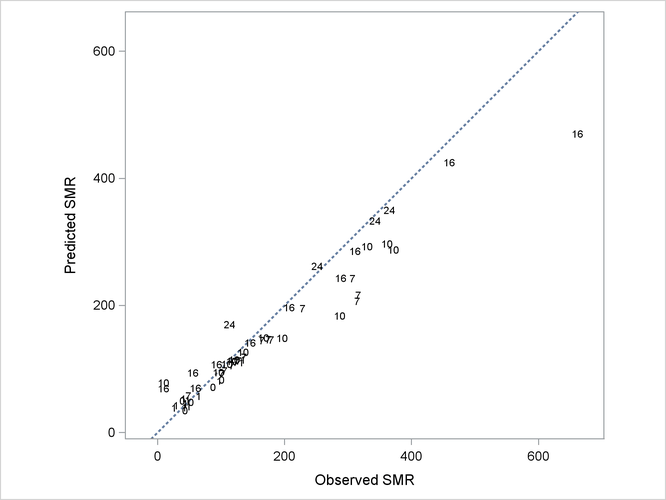 In Output 45.3.7, fitted SMRs tend to be larger than the observed SMRs for counties with small observed SMR and smaller than the observed SMRs for counties with high observed SMR. The GLIMMIX procedure defaults to maximum likelihood estimation because these statements fit a generalized linear model with nonnormal distribution. 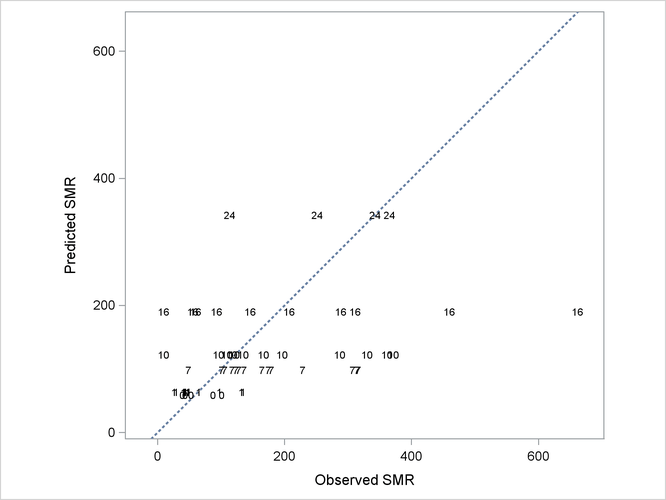 As a consequence, the SMRs are county specific only to the extent that the risks vary with the value of the covariate. But risks are no longer adjusted based on county-to-county heterogeneity in the observed incidence count. Because of the absence of random effects, the GLIMMIX procedure recognizes the model as a generalized linear model and fits it by maximum likelihood (Output 45.3.8). The variance matrix is diagonal because the observations are uncorrelated. The "Dimensions" table shows that there are no G-side random effects in this model and no R-side scale parameter either (Output 45.3.9). The estimates of and have changed from the previous analysis. In the GLMM, the estimates were and (Output 45.3.11). More importantly, without the county-specific adjustments through the best linear unbiased predictors of the random effects, the predicted SMRs are the same for all counties with the same percentage of employees in agriculture, fisheries, and forestry (Output 45.3.12).